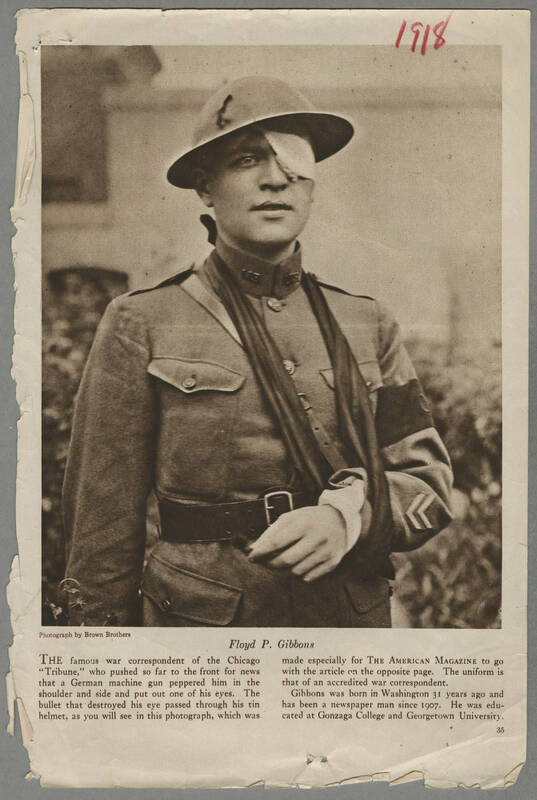 Floyd P. Gibbons THE famous war correspondent of the Chicago "Tribune," who pushed so far to the front for news that a German machine gun peppered him in the shoulder and side and put out on of his eyes. The bullet that destroyed his eye passed through his tin helmet, as you will see in this photograph, which was made especially for THE AMERICAN MAGAZINE to go with the article on the opposite page. The uniform is that of an accredited war correspondent. Gibbons was born in Washington 31 years ago and has been a newspaper man since 1907. He was edu- cated at Gonzaga College and Georgetown University.